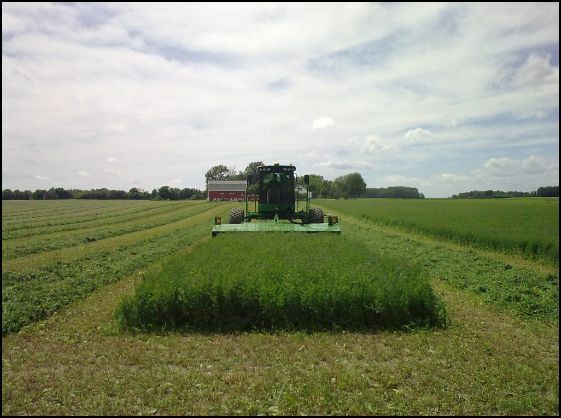 We all hate to leave strips of uncut crop, commonly called “skips,” in our hay fields. There’s not much yield wasted, but pride of a clean cut field is often lost to local cafe gossip. To avoid skips we typically overlap the cutterbar into the previous pass by a small amount. How much is this well-manicured landscape costing you in lost productivity? Precise steering so you achieve full cut width on every pass would make you more productive. On the other hand, driving at maximum cutting width can be a tiresome chore. Could automatic steering give us the break we need while maximizing the cutting width of the mower? These are some of the questions we set out to answer two seasons ago. We approached the problem in two ways. First, we conducted an experiment at the UW-Madison’s Arlington Agricultural Research Station to better understand what factors influenced how much we overlap. Second, we hit the road, observing farms and custom operators across the state to see how folks were driving. levels, the overlap loss increased. The second part of the experiment proved to be even more interesting. Here we measured pass-to-pass overlap on 15 farms. The machines included pull-type, mounted and self-propelled mowers with operating widths varying from 10 to 32-ft. The operating speeds varied from 5.5 to 12.5 mph. The overlap varied from 0.5 to 16% with the average around 5%. That’s 5% of the cutting width wasted with each pass. On a 14-ft mower that’s about eight inches per pass. Overlap averaged slightly higher for the pull-type at 6.6% than for the mounted and self-propelled machines at 5.2 and 5.0%, respectively. The other interesting fact gleaned from the study was that machines utilizing automatic steering with SF2 or OmniSTAR HP signal correction were able to cut overlap in half from 5 to 2.5% in the machines we observed. But could cutting overlap from 5 to 2.5% pay for the hardware needed for automatic steering? Well, the usual response of “it depends” applies. 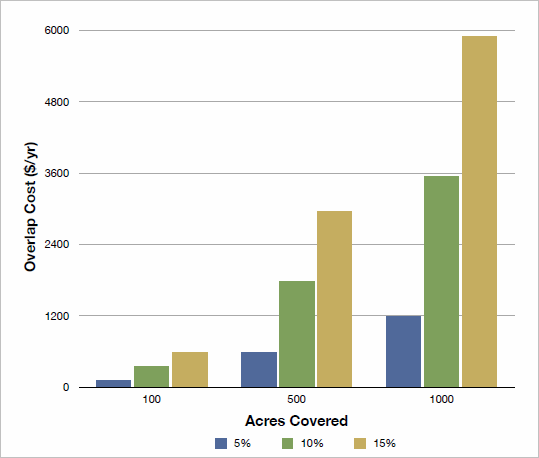 If you cover enough acres, the answer is yes. If you can’t pay for the system by mowing hay you’ll have to come up with other applications to spread the cost. Tillage, spraying and seeding would all be good candidates. I’ve compiled a chart based on the numbers using USDA NASS’s 2007 custom rate survey if you’d like to look at the payback on just using the system in mowing.